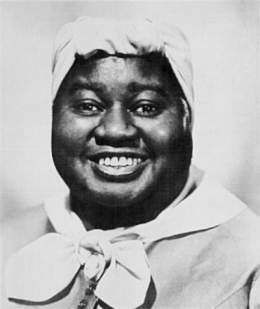 The most successful black film actor of her time, and one of the most recognizable and beloved character actresses of the 1930s and '40s, Hattie McDaniel made a name for herself playing primarily maids and servants in over 100 films, ranging from comedies and dramas to westerns and musicals. (Some estimate her film appearances to number as high as 300.) Though a few of her earliest characters epitomized Hollywood's most derogatory black stereotypes, as her career progressed, Hattie's roles evolved from being the object of humor to being the purveyors of it. Though still working as a domestic servant in white homes, her characters at their weakest occasionally talked back to their employers with increasingly biting honesty; at their best, they projected authority, humanity and common sense -- always with a sense of humor. A divisive figure among film historians and scholars who tend to see her as either a pioneer for or an embarrassment to her race, Hattie's place in the racial annals of cinema history has yet to be decided. But color aside, her performances are unquestionably those of a gifted actress and comedienne, and those gifts earned her both an Academy Award in 1939 and the esteem of millions of moviegoers. 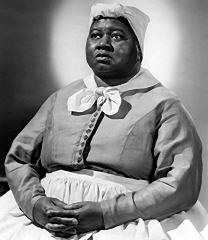 After years as a radio and vaudeville performer, Hattie McDaniel began her film career in the early 1930s playing bit parts such as Marlene Dietrich's maid in BLONDE VENUS (1932) and one of Mae West's jovial maids in I'M NO ANGEL (1933). 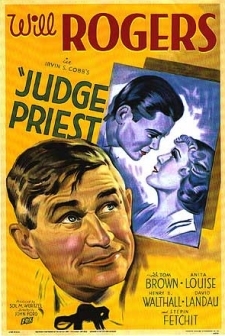 She first began to attract attention however when she sang a duet with Depression-era humorist and movie superstar Will Rogers in John Ford's southern comedy JUDGE PRIEST (1934), one of the first films for which she received onscreen credit. Following her JUDGE PRIEST success, Hattie suddenly found herself in high demand and the subsequent years proved to be some of the most prolific of her career. 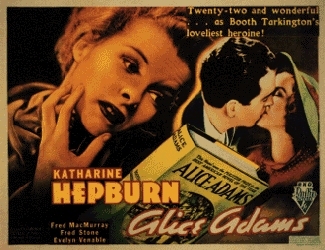 Among her more-than-a-dozen film roles of 1935 was that of Katharine Hepburn's hired help in George Stevens' ALICE ADAMS, adapted from Booth Tarkington's novel about a girl from a poor family with grandiose social aspirations. An unkempt, gum-chewing servant who performs her required duties to the least of her ability, Hattie's character sees through Alice's airs and makes a memorable contribution to one of the film's best scenes -- Alice's dinner party. Jerome Kern and Oscar Hammerstein II's groundbreaking Broadway musical SHOW BOAT, adapted from Edna Ferber's epic novel about the effects of racial prejudice and the scourge of gambling on the lives and loves of generations of entertainers traveling along the Mississippi River in the late 1800s, was first brought to the screen by Universal in 1929 as a mostly-silent film with a sound prologue of musical numbers. In 1936 the studio adapted the play to the screen again, this time as an all-talkie featuring several members of the original stage cast and three new songs. 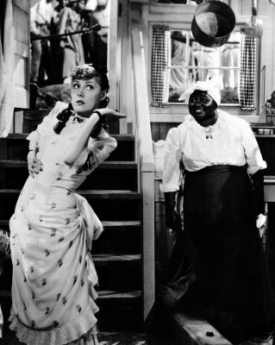 As Queenie, the wife of the Cotton Blossom's colored stevedore Joe (Paul Robeson), Hattie sang duets with both Robeson and the film's star Irene Dunne (left), including "Can't Help Lovin' Dat Man." Interestingly, when MGM made a third film adaptation of the musical in 1951 with Kathryn Grayson and William Warfield, the Queenie character was almost eliminated entirely. 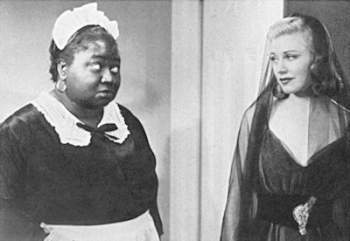 In the first of two films Hattie made at RKO with Ginger Rogers in 1938, VIVACIOUS LADY (right), she plays the small and rather unremarkable role of a washroom attendant. Later that year in CAREFREE (1938), Ginger's eighth musical with Fred Astaire and a decent screwball comedy, Hattie once again makes a very minor contribution, this time as an attendant (named "Hattie") at the country club where most of the plot takes place. 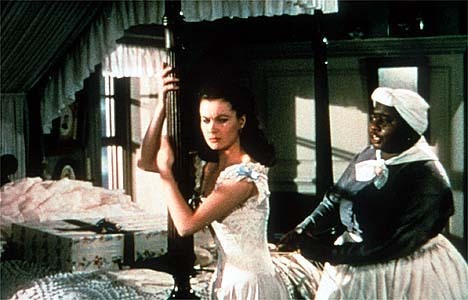 It was also in 1938 that Hattie landed what was to become the most important and famous role of her career -- that of Mammy in David O. Selznick's adaptation of Margaret Mitchell's Civil War epic GONE WITH THE WIND (1939). Arriving at her audition dressed for the part, Hattie's impressive ability to cry while reading the scene in which Mammy tells Miss Mellie about Rhett's all-consuming grief at the loss of his daughter earned her the coveted role over more established black actresses like Louise Beavers. And Hattie's outspoken, brassy comic performance opposite stars Vivien Leigh (left) and Clark Gable combined with her caring, compelling quieter moments earned Hattie praise from the vast majority of black film critics, many of whom had grown increasingly critical of Hattie and her unabashed willingness to play subservient film roles. Most importantly however, Hattie's performance earned her the respect of her peers in the film industry and an Oscar as the year's Best Supporting Actress -- making Hattie McDaniel the first black actor ever to receive an Academy Award. "Academy of Motion Picture Arts and Sciences, fellow members of the motion picture industry and honored guests: This is one of the happiest moments of my life, and I want to thank each one of you who had a part in selecting for one of the awards, for your kindness. It has made me feel very, very humble; and I shall always hold it as a beacon for anything that I may be able to do in the future. I sincerely hope I shall always be a credit to my race and to the motion picture industry. My heart is too full to tell you just how I feel, and may I say thank you and God bless you." --Hattie McDaniel's Acceptance Speech delivered on January 29, 1940 at the 12th Annual Academy Awards.